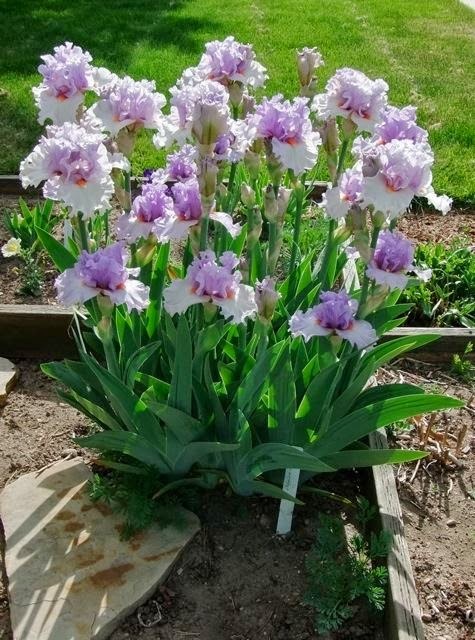 The familiar Gladiolus is a well known member of the Iris Family. Most species and hybrids are from southern Africa and not hardy in much of North America. 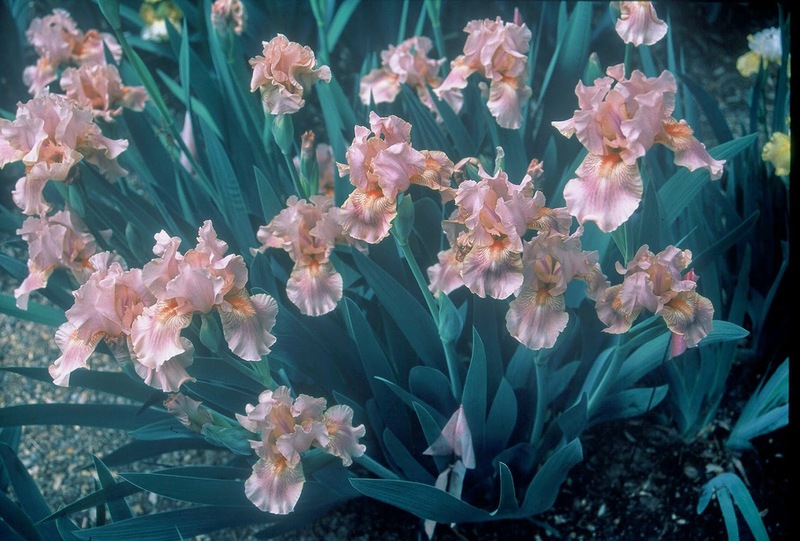 However, there are the less well known European Glads that are remarkably cold tolerant. With the exception of G. italicus which is easily obtained at any garden center in the Fall, the other species are unfortunately somewhat rare. The largest and showiest in my garden is Gladiolus byzantinus. It is over three feet in hight and has large colorful flowers. There is more than a bit of name confusion surrounding this species and the next one I will show. They will often be listed as Gladiolus communis ssp. byzantinus or Gladiolus byzantinus ssp. communis. A close second for height and show is Gladiolus communis. It is very similar to the previous Glad but flowers a week or two later in Kansas City. 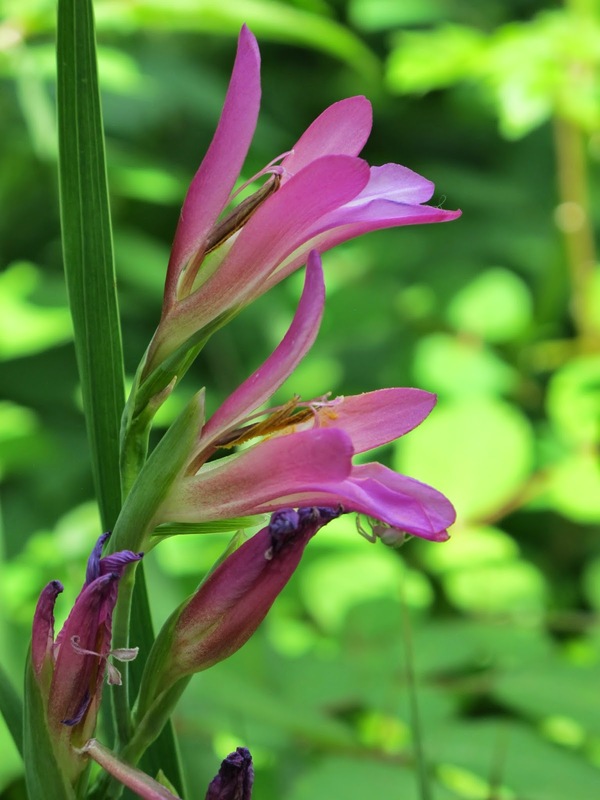 The easiest to obtain of all hardy Glads is Gladiolus italicus, in fact it is often the species you receive when you purchase corms or seeds regardless of the name given. Seed exchanges run by SIGNA (Species Iris Group of North America) and NARGS (North American Rock Garden Society) are your best bet to get the correct named plants although not guaranteed. There are few color forms available although the shade can vary between different seedlings. I obtained 'Texas Snowflurry' through Plant Delights a few years ago. I have yet to capture a good photo of it as it needs dividing badly and flowering has suffered. A shorter, front of the bed Glad, is Gladiolus illyricus. Possibly one of the hardiest members of this group it suffers from fewer flowers although it makes up for that as it is a very good grower. These and maybe a few other species are hardy to at least USDA z5. I have tried to ID what I grow but am not 100% sure if all are correct. I have yet to grow Gladiolus palustris, the most northerly of the European Gladiolus. 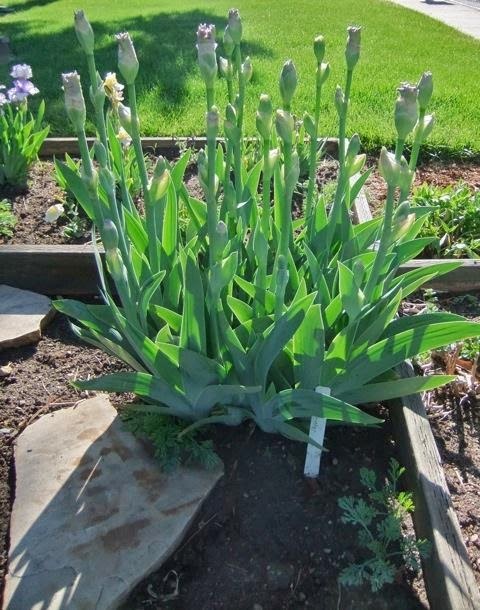 All flower in mid to late Spring and peak just as the Tall Bearded irises are beginning to wane. I hope I have piqued your interest and an increased demand for the hardy Glads may spur an enterprising nursery to offer a wider variety. One final note, these all prefer to be planted in the Fall as do most hardy bulbs. If only irises had ears, what could we achieve? At last it’s May here in Michigan, the heavy winter snows have finally melted, the daffodils are in full array, and the Siberian irises are awake again and throwing up shoots that are now several inches tall. The long heavy snow cover this winter was a wonderful mulch and they have come through in excellent shape with no obvious losses – perhaps the only positive from this winter, which our meteorological expert at the university described as “a once in a lifetime event and you can bet on it.” He’d better be right. Even now it’s hard to believe that only two months ago the seedling rows in the photo taken last week were under 12-18 inches of snow that had been there since late November. So as the annual cycle turns, it’s time to start thinking of what we shall see in another few weeks as bloom is at its peak. And particularly, from a hybridizer’s viewpoint, how will some of the recent seedlings that seemed notable last year perform this year? Will that rather puny but lovely seedling take off and grow now? Will the one with only three buds throw a few branches as it grows up? Is that exciting photo from last year for real, or did a bit too much Photoshop give it artificial glamour? Experience indicates with certainty that not all these wishes will come true, but one success can make up for several disappointments Getting all the good qualities together in one plant just ain’t easy. So let’s walk down the newer seedling rows, make some mental wishes, and talk to the plants about what they need to do to succeed in life. Here we have a tetraploid seedling (11R9B3) that combines the red and yellow shades nicely. The flower looks fine, and the plant is robust, but last year, like so many tetraploid seedlings, it bloomed a bit low in the foliage – will it rise up this year? Growing next door is a promising yellow tet seedling (11R1B12), of which there are no large number around. This has the same problem – massive growth but needing just another two inches of stem to be perfect. Just grow up a bit will you guys? You can do it with some positive thinking. Seedling 11Q3B1 was a complete and pleasant surprise among the new tets, since it bloomed a good foot higher than its siblings, ending the season with stalks 45” tall, but the flowers, although pleasing, are really not all that original. What I really wanted to see was the plicata-like pattern on a yellow ground. And here it is, on a sister seedling, 11Q3A7, but that one bloomed much lower. So will this seedling in its second year elevate its performance to match its sib? Just look over at your sister there – if she can do it, so can you. Surely you aren’t going to let her beat you. Go for it. Continuing with red and yellow mixtures, several diploid seedlings bloomed for the first time last year with interesting colors (12Q3B3, 12S3B2, 13P4B6). Of course, they will need to grow and flower well, but that’s another hurdle to be cleared. Ten years ago these would have been to die for, but in that time we have seen lots of such combinations introduced, primarily by Marty Schafer and Jan Sacks, so to be taken seriously, these must have something different that makes them not just “me too.” We shall see. Dare to be different, but keep in mind that three falls is quite enough; four is just a bit too different. And all of you, if you’re going to fade after the first day, try to do it slowly and gracefully. Then we get to 12S8B4. Not much to say here except that's exactly what I had hoped for, just keep it going. Great deep color contrast, nice bud count. A petite plant, but no matter, there’s room for those in the garden too. Wow, you’re looking great, but that foliage might be a tad untidy, could you straighten it up just a bit? An area that continues to fascinate me for whatever reason is the multipetal Siberians. They present a special challenge in that each flower can have a different combination of flower parts and some look much tidier than others. Seedling 12S2B21 was one of several in a cross I made for smaller multipetal flowers that on first bloom last year seemed to have come out very well, and, for once, most of the flowers were similar and quite tidy with just one layer of falls under a central bouquet of multiple standards and florets. Fingers crossed that it does as well again this year – and puts on a bit more growth. Perhaps you’d like a little extra fertilizer? Another goal is either a yellow amoena or pure yellow multipetal. It seems that seedling 11M7B5 is taking us well along to this objective. Just stay tidy and grow up a bit, and one day you could be queen of the show. So we shall find out in just a little while which, if any, of these seedlings has paid attention to my advice and encouragement (threatening plants does no good I find and makes for a bad atmosphere in the garden). Discovering which have responded is what make anticipation so delicious. Although I might not let on to the plants, there is a price for not paying attention: and that’s a one way trip to the compost pile where heedless irises go. Their better behaved companions move on into the next stages that can end in getting their own name, an introduction to the wider world, and a shot at fame. Every year The American Iris Society sponsors a photo contest. 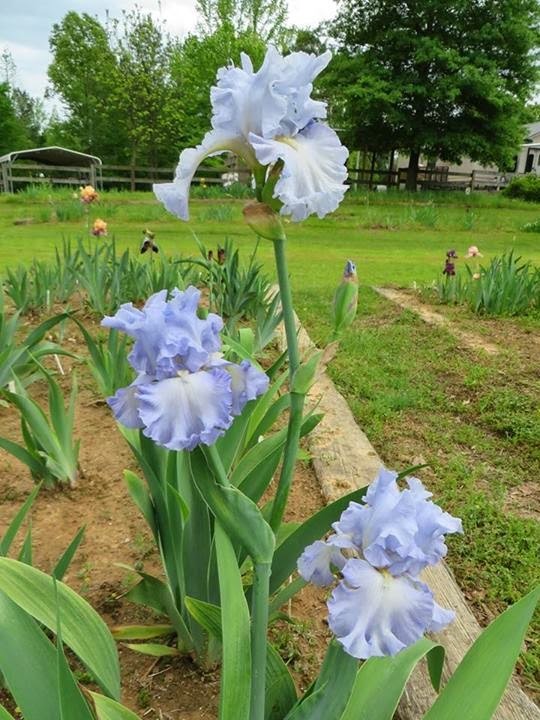 Concentrating generally on irises, the people who grow and hybridize them, and their use in garden or natural settings, the contest is open to anyone who submits a picture. The specific categories vary from year to year, and are open to adults and youth alike with separate awards for youth submissions. We hope many of you will participate! "Talking Irises" TALL BEARDED IRISES--WHAT IS A "SHOW STALK" IRIS? As a lover of irises but not well-versed in the particulars of show bench judging, I wanted to learn more about what makes a "show stalk" iris. My quest led me to several iris connoisseurs of whom I have the utmost respect. Hearing what they had to say has led me to believe that there are several thoughts on the subject. I present some of those ideas now for your consideration. Another expert, hybridizer Walter Moores, who has had experience in both judging and showing, says that a specimen with one bloom can win "Queen of Show, but generally the judges look for one with 2 or 3 blooms." He goes on to say that the "Queen should be perfection, or near perfection, for its class," with "a new variety given preference over an older variety," which has proven a "controversial statement in the manual." He shares some good examples of show stalks. 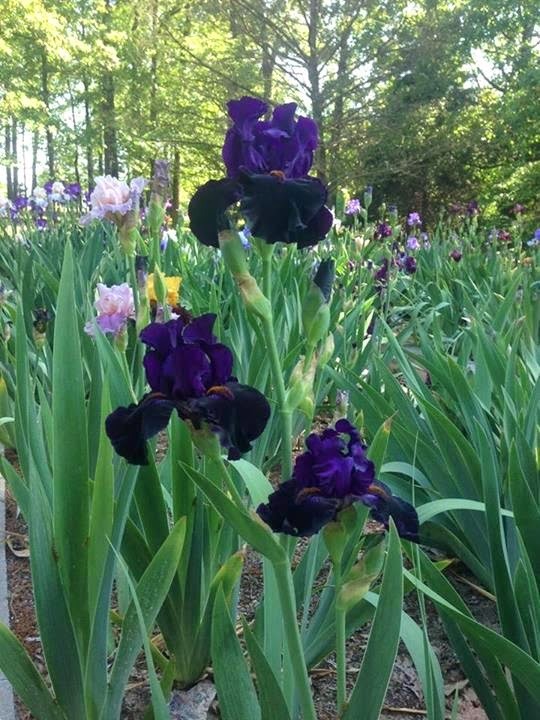 Betty Wilkerson, hybridizer, judge and iris expert, tells us "the requirements for show bench irises are much different than for garden irises." She adds that with show bench irises we want 2-3 open blooms, but in the garden we want one at time so we get a long bloom season." She goes on to say "wide branching can be nice on the show bench, (with balance), but can tangle stalks in the garden." Thomas Johnson, of Mid-America Garden says the term show stalk means that it is a great iris for showing and that a "show stalk is one with wide candelabra branching, nice bud placement and a good bud count." 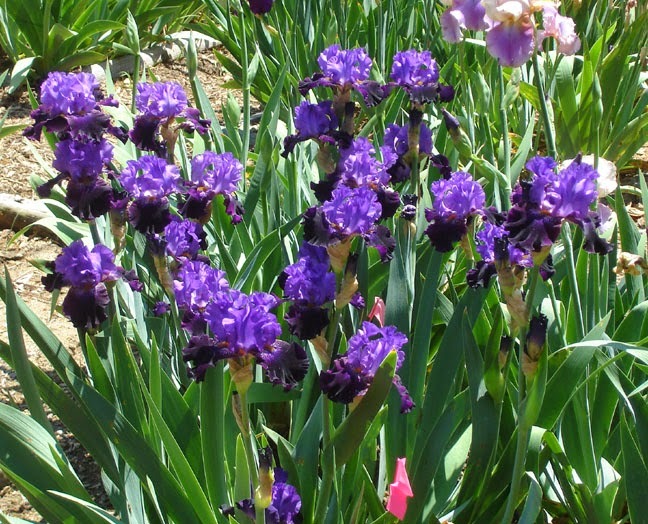 Joel Shaber, iris enthusiast, says as a gardener he is "primarily interested in branching which shows the best advantage in a clump. Wide branching, with lots of space between the flower and the stalk" is not something he "looks for, nor particularly likes." He says he "much prefers a closer-to-the-stalk presentation, where the flower's edge very nearly touches the stalk, but stops just short of doing so." He says that "this style of branching gives a proud, upright look" which he likes, as we can see in these pictures he shares of one of the clumps in his Boise, Idaho garden. Joel shares his 'RIO ROJO' Schreiner '09 (below), with show bench wide branching, and compares it with 'BELGIAN PRINCESS' (above), with closer branching, to help us see the difference. Although there are three open, well-positioned blooms on Rio Rojo, he tells us "there is something more to consider." He tells us to "look at the foliage-to-stalk ratio and how gangly and awkward the clump presents itself." He goes on to say this is his "annoyance with the modern obsession with show branching," and when comparing Rio Rojo to Belgian Princess, it's plain to see "how stately Belgian Princess presents itself in both bud and in bloom, with straighter stalks, and many more blooms," although they are both beautiful. A few years ago my Pacifica irises started to flower well. More new plants lived than died each year, and flowers opened by the dozens on some plants. It was time to take the next step and start hybridizing. I tried crosses by hand, but after three years with no success, I went back to relying on bee-pollinated flowers for seed set. That worked well, though I wasn't always around when pods opened (more on seed pods in a later post). Then for the next few years, including this spring, the weather was wet, wet, wet. Too wet for bees, way too wet for hand pollination. 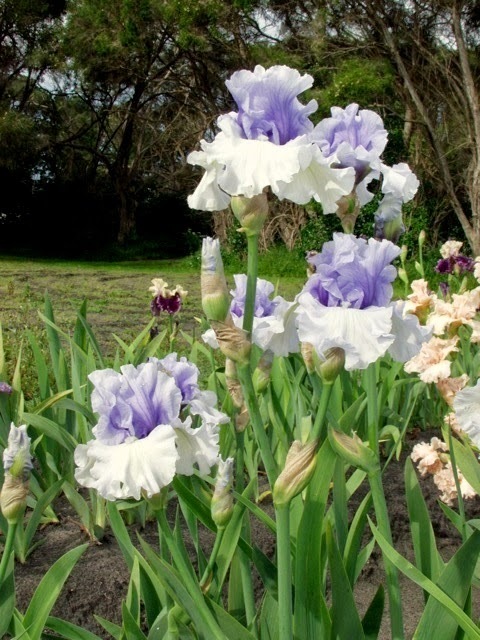 None of the early to mid season flowering (March-April-early May) Pacifica Iris set seed. Only the late season (late May to late June) plants set seed, and these tend to be the late species and species crosses, not the highly desirable early flowering hybrids. 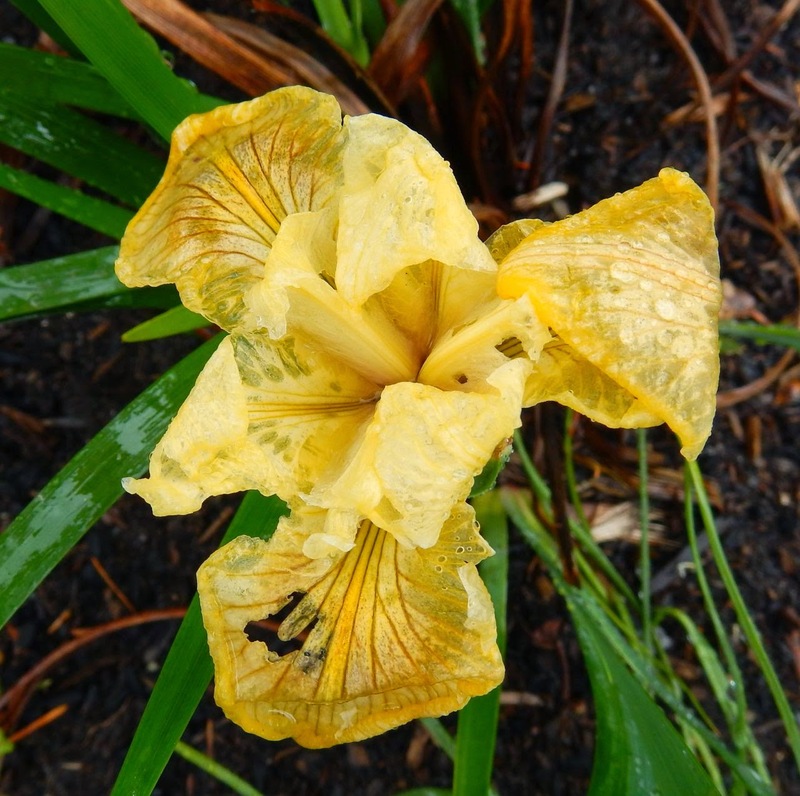 A familiar situation: soggy yellow Pacifica Iris seedling, unnamed, after two days of wind and rain. Flowers are in full bloom, and the weather is dreadful for pollination. This year I decided to do something about the rain. 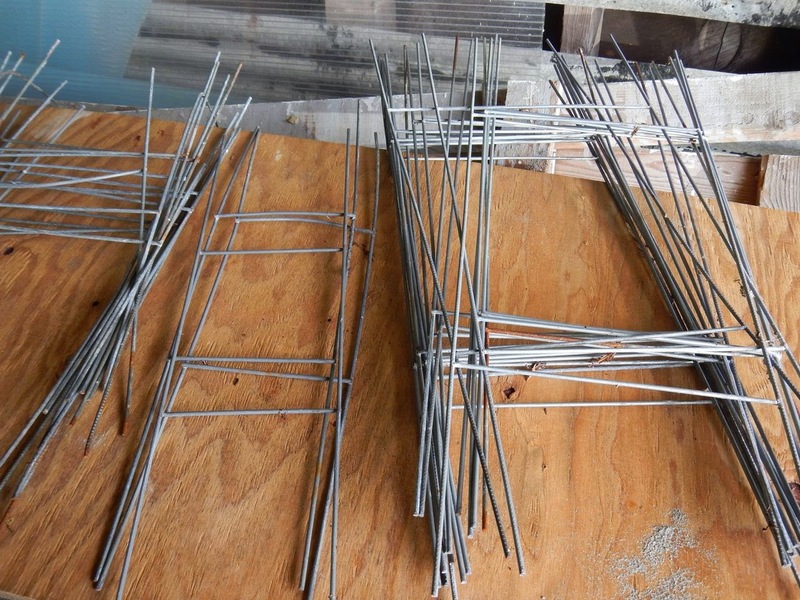 Using scrounged materials, including scraps of twin wall polycarbonate greenhouse glazing and wire sign mounts [the kind used for small event and political signs], I fashioned rain screens. The old signs can be painted some innocuous color and placed in the garden to provide shade on seedlings or transplants, by the way. A scrap piece of twin wall polycarbonate, ready to cut down to a useful size. 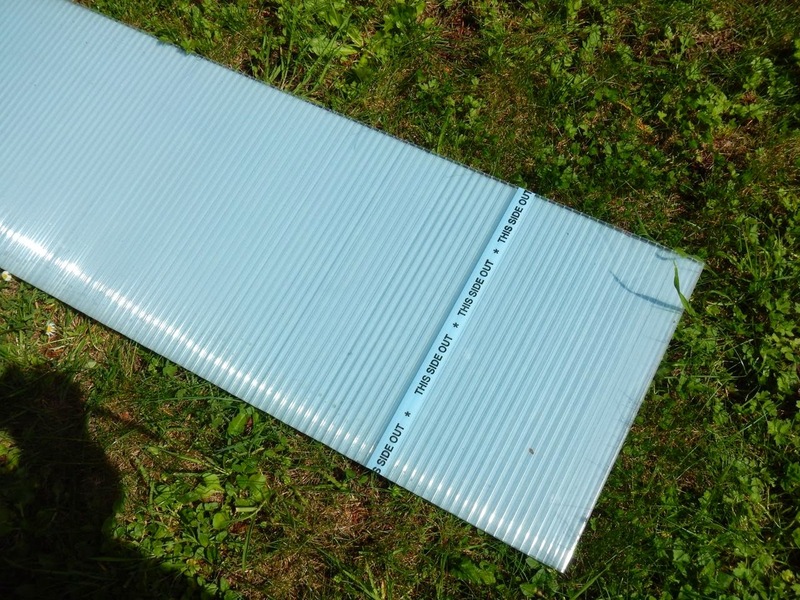 These panels come with protective films on both the inside and outside, which are peeled off when ready to use. I picked out a likely scrap of twin wall polycarbonate and two wire mounts, one large, one small, and bent the top wires over at angles of 135 and 45 degrees. The large one, for the upper end, I bent past 90 degrees to about 135 degrees, and the small one, for the lower end, I bent about 45 degrees. The parallel bent wires were slipped into the ends of the twin wall channels, and then the bottom straight wires were pressed into the ground. I thought about adding a wire or twine over the top to hold the wires to the twin wall, but decided to wait and see. Also thought about some bricks on the lower cross bars, now at ground level, but again, decided to wait and see how this test unit survived. Rain screen deployed in my garden, with taller wire frame on left and shorter frame on right, the twin wall is inches above the plant, so that no leaves or buds touch or are near the panel. The very first day that the first rain screen was up, we had rain and winds above 30 mph. That night, it rained so hard that it sounded like hail more than once. And the next day, more rain, this time in intense brief squalls, with wind gusts above 20 mph. I was out canoeing that day, and checked on the rain screen when I came home. 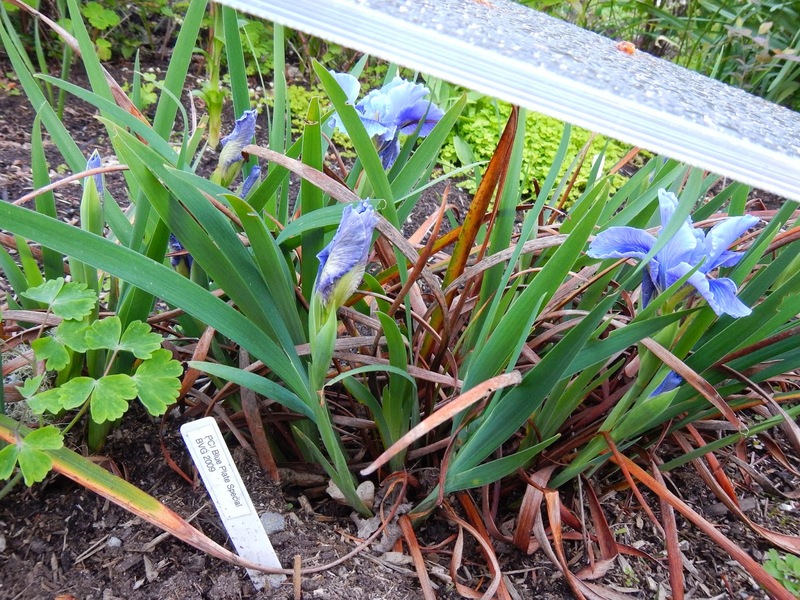 Not only was it intact, two flowers had opened on the clumps underneath it, a patch of Iris 'Blue Plate Special'. Bumblebees were still buzzing around when I went out before dusk to take photos. Rain on top, dry flowers beneath, Iris 'Blue Plate Special' is the test plant for this rain screen. The garden looks strange with these deployed strategically over important plants, like a greenhouse fragmented into pieces that blew out over the garden. But I look forward to a few more seedpods this coming year. I like to think the bees like it too, dry flowers in an otherwise wet day. The goal: dry flowers during mid spring on the south coast of Washington. Iris 'Blue Plate Special' has a chance now to set seed for the first time in four years. There's a lot going on in a flower to set seed, none of which is helped by heavy rain or wind. I have high hopes for my rain screens. 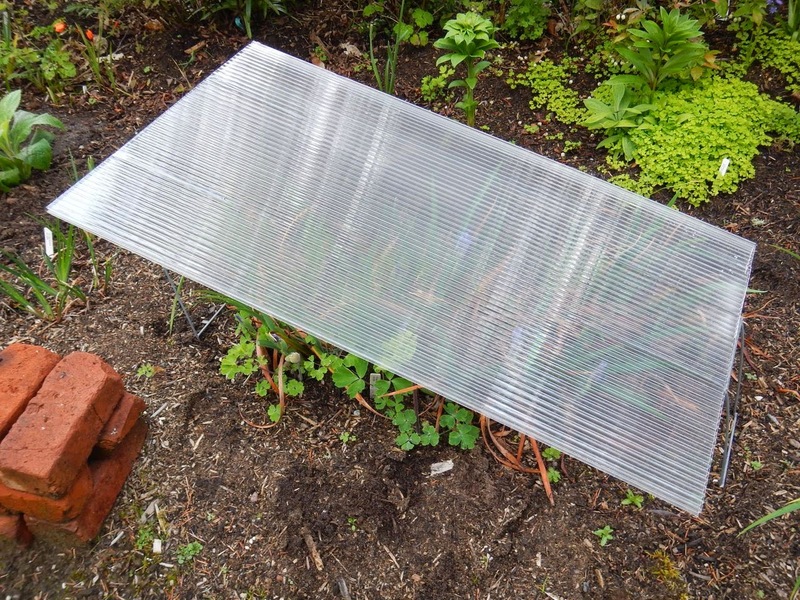 Have you ever constructed something to protect your precious irises? Tell us about it in the comments section below. I just read the above quote and had to share it with all of you, not just because it made me smile when I read it, but also because it expresses such joyous feeling. Thank you gardeners, flower lovers, iris lovers who follow the news we report from The American Iris Society and for all your contributions in the many ways that you express yourselves. 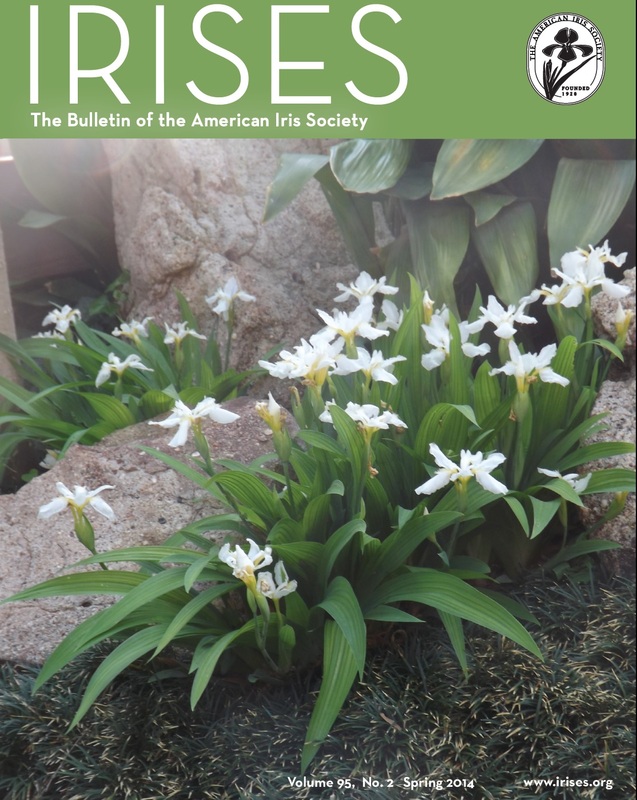 The Spring 2014 issue of the AIS Bulletin is now available for online viewing within the Emembers section of the AIS website. This leaves no doubt as how to access this and other issues online. For those receiving the printed version, it's on its way to you, and you should receive it soon. 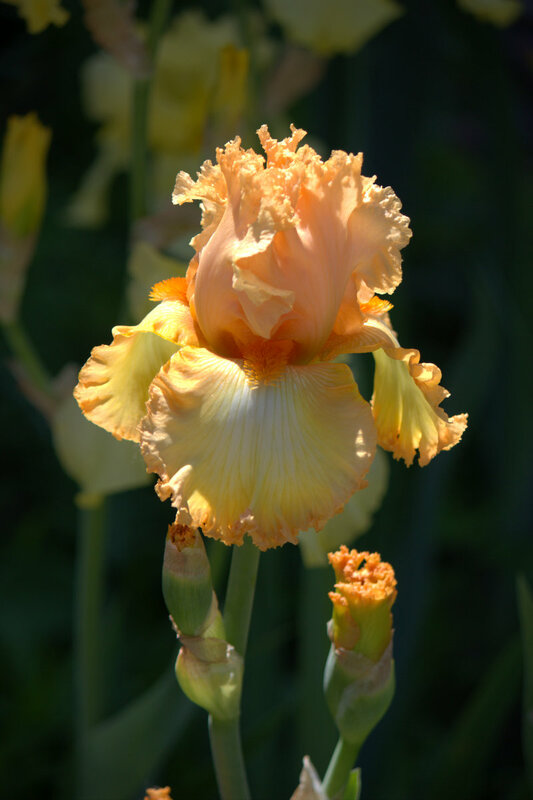 Kathleen Sonntag, our new AIS IRISES Editor clarifies something new right off the bat: issues are now named after each season. This issue is called Spring 2014, instead of being named after a month. I know, we have changed this many times before, but in fact to name each issue after a season sounds very interesting and appealing, doesn't it? Photographing Iris in Complete Focus, a great guide loaded with tips by Ken Walker. The 2014 AIS Photo Contest is formally announced, by Janet Smith. Don't miss the fantastic picture of iris Winogradowii, by Dr. Radionenko, on page 9. The current Youth Views article presents a very enthusiastic youth group from the Santa Rosa Iris Society; and read about two Regions which groups account for more than 100 children involved. Wow. 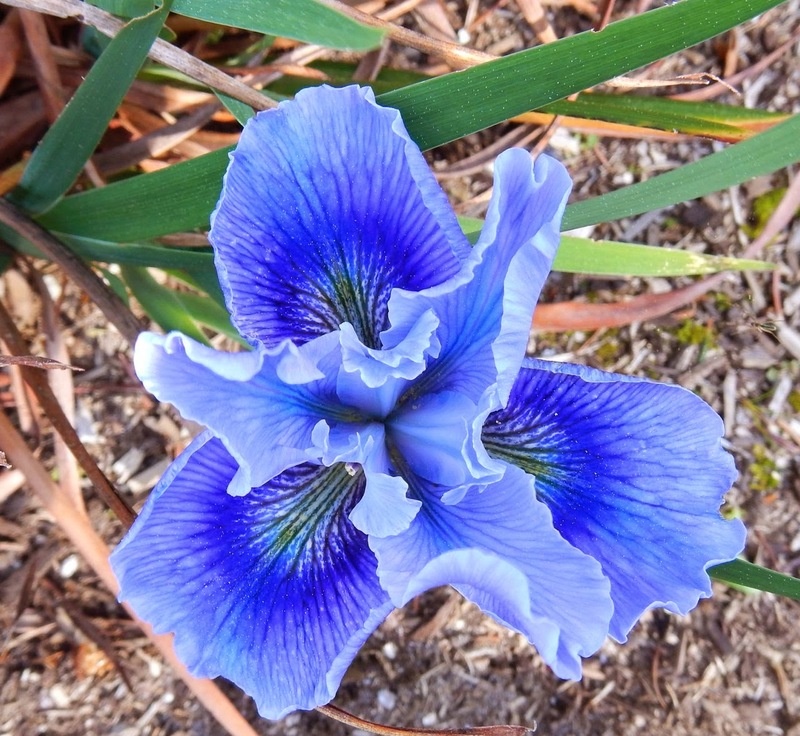 Section Happenings keep us appraised of the activities at The Dwarf Iris Society, the Historic Iris Preservation Society (HIPS), The Median Iris Society, and the Spuria Iris Society. The Novelty Iris Society, oh wait, you don't know about this. You need to read the news on page 17. 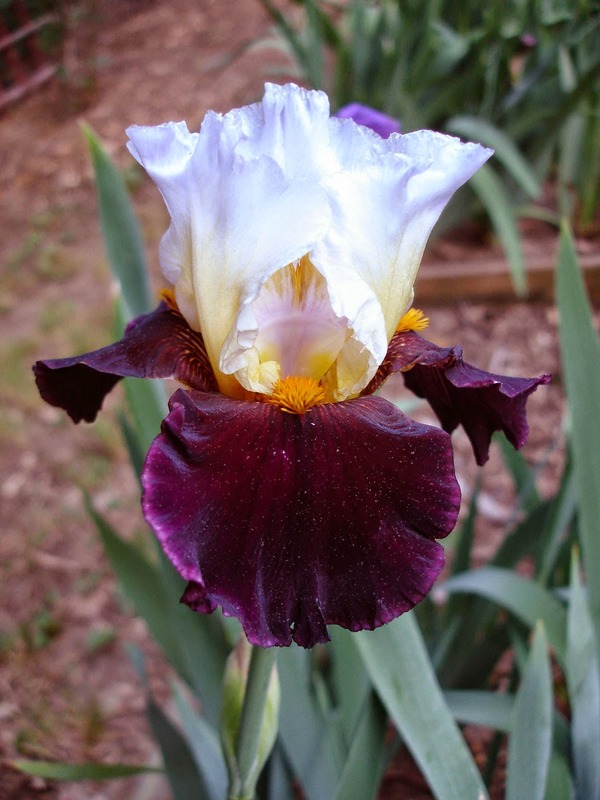 Preserving Small, Historic Irises, by Charlie Carver. Rebloom Looks For New Avenues, by Mike Lockatell. And, there's so much for to this issue, and I am happy to let you discover the rest of the articles. I know you will find them interesting. Remember that if you are an emember you can access this issue online NOW. Iris Hybridizer, Spare That Sprout! Beginning hybridizers are often advised not to make decisions about new seedlings in their first year of bloom. This is good advice for a number of reasons, not the least of which is that a hasty decision could result in sending to the compost pile what might have been an award-winning variety. Actual practice among hybridizers varies, with some advising that a seedling should be evaluated for at least 3 years and, at the other extreme, some yanking and discarding first-year plants that don't please them. Hybridizers whose growing space is limited may be forgiven if they fall into the latter category. Even though my own garden is spatially challenged, I have always tried to follow the "at least 3 years" practice -- at first, simply because I respected the advice of more seasoned hybridizers that the first year of a seedling's bloom doesn't necessarily represent what the flower may do in its second or third year. 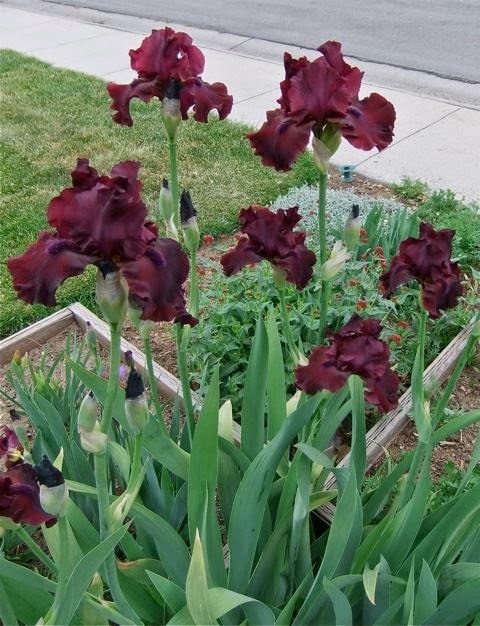 Over the course of years, however, experience has taught me that irises not only mature, but do so at different rates. And maturation isn't the only thing that can change a plant's appearance. Replanting and moving from partial sun to full sun, for instance, can make quite a difference in stature, and a difference in soil can affect color. 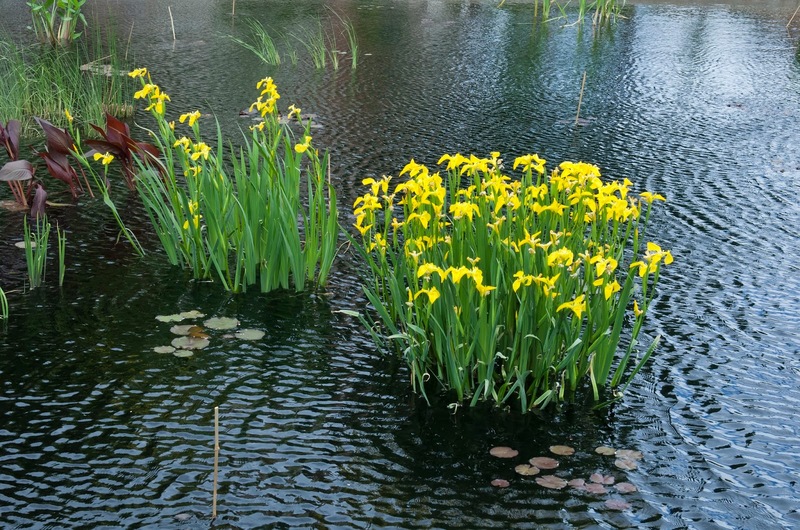 In a recent post on Iris Lovers, I mentioned that I came close to discarding IB 'Coral Chimes' when I first saw it, because it seemed to be the ugly duckling in a bevy of mostly cheery yellow-and-white siblings. Its single bloom seemed muddy in color. Nevertheless, I spared it, and still couldn't decide in the second year. By the third year, however, it had matured into a glorious clump of coral-hued blossoms that reminded me of a fresh-faced choir. I didn't waste film on it the first 2 years, but here's how it looked in the third. I also save ungerminated lots of seeds from what I consider important crosses. I mention that because the next example of maturation has a really unusual history. In November, 2000, I planted 45 seeds of Brazilian Holiday X 98G1:(Lady Friend x Chinese Treasure) in three pots. None germinated, but I saved the pots, letting them ride out the weather unprotected for the next 5 years (I'm stubborn). In 2005, a single seed sprouted. I planted it out as 05I1, although there was no "2". It didn't bloom until 2007, and then was only border bearded in height. Still, it was an amoena with dark velvet falls, and I was pleased. The little thing was planted in a bed which was shaded at midday by a dogwood tree. After its second year of bloom, in 2008, I replanted it in a full-sun location. Voila! In 2009, it bloomed at full TB height, well-branched, AND with a golden glow at its throat. 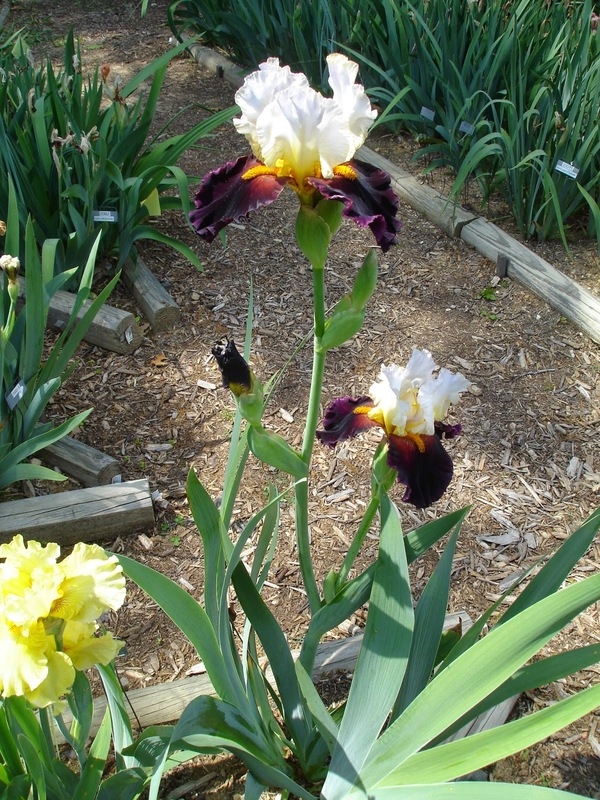 It won "best seedling" at the Fredericksburg Area Iris Society show in 2011 and was introduced as 'Lezghinka' in 2012. Finally, another benefit of holding onto seedlings for a while is that you may benefit from others' perspectives. Seedling 064C10 had, from my point of view, a rich heritage ((Marguerita x Mamauguin) x Best Bet) X Ranks of Blue. Nonetheless, it sat in my garden and was moved around as a re-select for some time until it produced a huge clump and attracted the attention of other irisarian visitors. Acting on their advice, I introduced it in 2012 as 'Night Bird'. So, examine your seedlings with a critical eye, but don't be too quick to toss them.